Getting ready for the 2015 Seawolves season was challenging because of the extreme weather conditions. The month leading up to the opener was full of cold weather and precipitation which was extremely hard on the infield dirt. My crew of 12 members worked continuously to try and dry out the infield. We worked through rain, snow and hail to get the job done. Unfortunately, it rained the day of the opener and all of our progress was set back. We played a double header the following day to make up the postponed game. Poor weather conditions at the beginning of the season are nothing new in Erie. However, we have made some improvements that are different this year. A concrete wall and new field gates were installed behind homeplate. 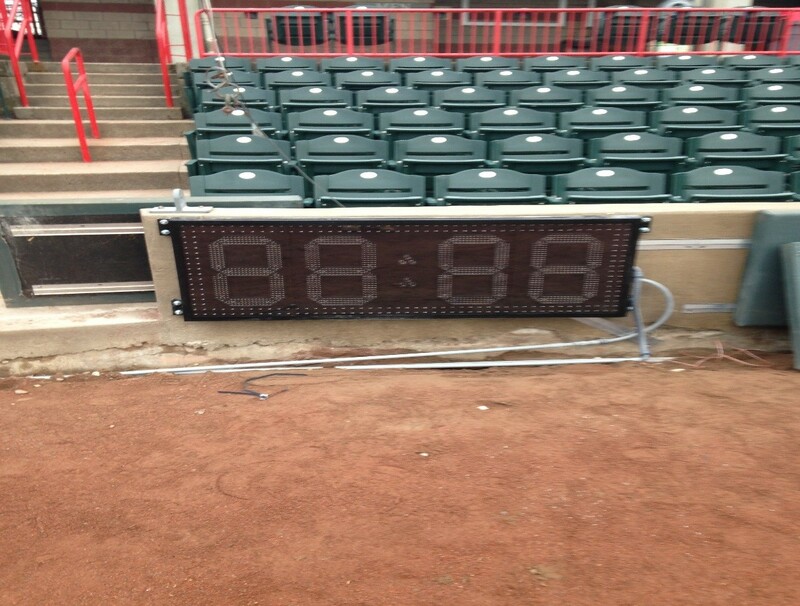 After the backstop wall was completed the “Pace of Game” clocks were attached to the wall and one was placed behind the outfield fence. We also put up new wall pads in right field to ensure the safety of our players. After the 2014 season we installed walkways going from the dugouts to homeplate. This gives the field a fresh new look and cuts back on re-sodding the field. We also built new bat and helmet racks for the dugouts. It’s going to be a good season at Jerry Uht Ballpark! The new look of the field is not only noticeable, it is very appealing. congratulations to the crew!